In any given week I’m doing continuing education in the fields of training, business, marketing, personal development, and leadership. And as you may (or may not) know, tomorrow is my beautiful daughter’s second birthday. Look – I know you come to RTS so I can tell you how to get more out of exercise. Or how to be a better coach. And while I feel like I give you that 98% of the time, allow me to go on a slightly different path – while ultimately giving you something that I feel you desperately need to hear. It’s amazing, but people assume that just because you’ve had some modicum of success in your life, that you have everything figured out. And while it’s flattering, I can tell you this much – I have a lot to learn. One thing that I’ve always struggled with was focusing on the big picture, or what was most important. Without a hierarchy or focus on what’s most important, it’s incredibly easy to feel overwhelmed. Quite simply if you don’t know what’s most important, suddenly everything becomes important. You may not believe in self-help or motivational mumbo jumbo, but one tactic he described here has made a profound impact on my focus. Imagine you could only accomplish five really important things this year. But if you completed all five of those tasks, it would make 2013 the most successful year of life. How would you go about completing those tasks? And most importantly, how relieved would you feel to have the focus, or the clarity, to really dial in on the big-picture things in your life? I can tell you this much – since I did this one simple task, I feel like a burden has been lifted from my shoulders. I have a very clear idea of what’s most important in my life, and where I need to focus my time and energy. And in a potential time of conflict, I simply look at my list and use that hierarchy, focusing on that top-level item! But without some concrete thoughts, this is a lot of hypothetical BS. Here’s my actual list of what’s important – I wrote it down and placed one copy in my car, and another near my vanity in my bathroom. I see this list numerous times every day, which is a constant reminder of what’s most important. And to really take this to the Nth degree, I’m going to take you into my world for the next 3-5 minutes so you can perform this same task yourself. If you were to die tomorrow, who would attend your funeral? What would they say at your eulogy? This isn’t meant to sound morbid, but rather to get you focused on what’s most important in life. All that money you want to make? Sorry pal, but you can’t take it with you. Instead, it’s the people you’ve impacted, the lives you’ve influenced, that are most important. My goal is to live to the ripe old age of 100, but just in case, I don’t make it there I make it a goal to spend quality time with my family each and every day. No if’s, and’s or but’s about it, they are the two most important people in my life. As a fitness professional, it’s easy for others to assume that working out is easy for you, or that you want to do it all day, every day. Sometimes when you’re a fitness professional, training is the last thing you want to do! This can be compounded when you’re opening a facility, as you’re often burning the candle at both ends and working ridiculous hours in an effort to make ends meet. However, I also know that when I’m taking care of myself and focused in my training, I’m an easier person to get along with. Quite simply, I’m a better person when I’m training than when I’m not. Too often, we think that taking time to ourselves to work out makes us selfish. This is even more true when you have a family, children, etc. But I can tell you this – what happens if you don’t work out? At best, you’re a less awesome version of yourself. And at worst? Maybe you don’t live as a long or healthy a life as you should. At the risk of sounding selfish, I know that I’m the only person who can take care of me. When I’m working out and training hard, I feel better about myself and that spills over into improvements in all the other various aspects of my life. Damn, Mike is a selfish SOB! This bro wants to focus on his training AND his studying/continuing education? Call me crazy, but again, I know that when I take care of myself and those closest to me, everything else in my life kind of falls into place. While my path is constantly changing, I realize that I’ve been put here to help lift others up. Sometimes it’s the clients or athletes I come into contact with at IFAST. Sometimes it’s the coaches, trainers, and business owners I meet when speaking. And sometimes, it’s just sitting down and having a chat with someone like yourself on my blog. But this is what I’m here for – to take my knowledge and skills, and then use that to help other people become better. The strange thing is, that role can be weird from time to time. I’m not your classic “internet” expert. I’m not the 6 am – 7 pm, grind-it-out, in the trenches coach I was 2-3 year ago, either. And I definitely don’t fancy myself the classic business owner or entrepreneur. Which leaves me in a weird place. But at the same time, I’m ok with that. I’m done trying to define myself or put a label on what it is I do. My goal is to focus on learning, filling in my knowledge gaps, and helping people like you become progressively more awesome. The details will take care of themselves. Over the long haul this could also be labeled “Robertson Training Systems,” but for the year 2013, my goal is to make Bulletproof Athlete the single-best fitness product on the market today. I don’t want to let all the cats out of the bag here, but needless to say, this project has taken on a life of it’s own. 3 programs for the price of one. Videos to compliment damn near every component of the program. And quite simply, a program that will help you move and feel better than ever before. It’s been nearly 2 years in the making, but I know this product will change the landscape of the online training scene. IFAST is where we take all this talk, all this knowledge, all this theory we accumulate, and actually do work on real, live people. We’re not the biggest facility. We’re not the fanciest facility. But I’d put our small, local facility up against damn near anyone in the country when it comes to assessing clients, writing a killer program, and coaching them to get amazing results. As amazing as it is helping people online, there’s something real and unique about working with someone in person, and helping them develop the body they’ve always desired. The best part about IFAST is that while it’s taken 4-5 years, we’ve really started to gel as a team, and we’re more focused than ever on the type of client we want to work with. I really feel like the sky is the limit with regards to IFAST. So there you have it – the five most important things in my life with regards to 2013. If I use this as a hierarchy or standard to keep me focused and grounded, I have no doubt whatsoever that 2013 will be my best year ever. 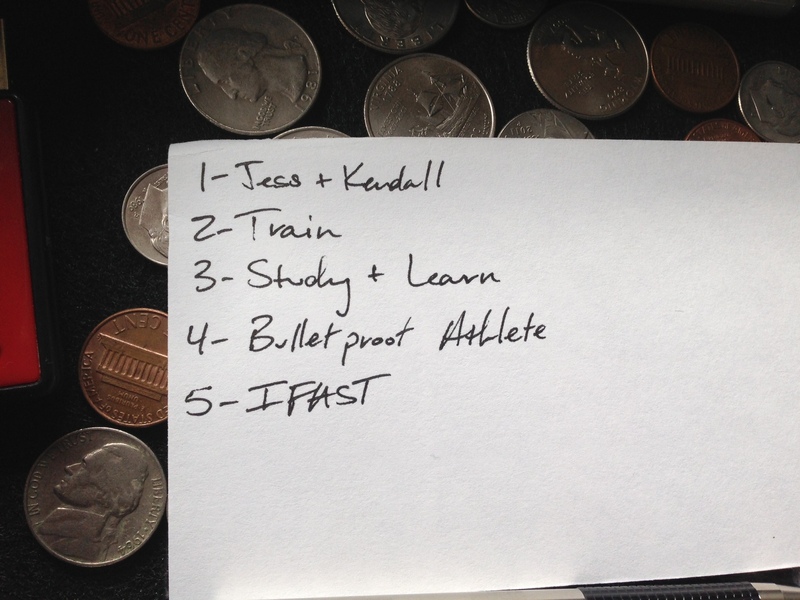 List your 5 most important goals or foci for 2013. Once ranked, list them from most to least important. 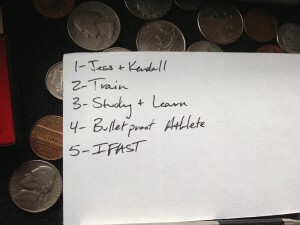 Write this down on 2-3 notecards and place them somewhere you’re likely to see them every day. I sincerely hope this post has helped you take a step back to realize what’s most important in life. Great advice, Now where is my pen! Well said. Love this post. 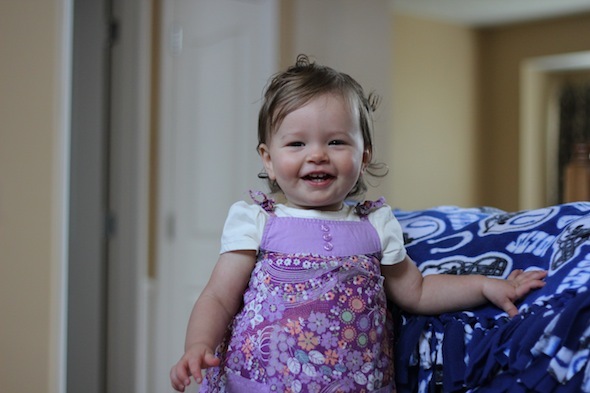 Happy 2nd Birthday to your daughter…she’s a cutie! I love Robin Sharma and follow his books, blogs, videos, etc. “Clarity preceeds mastery.” Such a simple and powerful concept!